HADDONFIELD, N.J. -- Given that Cretaceous-era creatures lived in a more humid environment than our own, it was perhaps appropriate that last Saturday's Dinosaur Day began with a stiff lashing of rain. A crew of dinosaur marchers takes its place at the head of the Dino Day parade just minutes before the heavens let loose with a deluge of rain. Also see larger photo. rather than baseball weather today," said Mayor Tish Colombi. She was speaking to some of those gathering on Kings Highway for the 10 a.m. parade that included both Little Leaguers kicking off their season and paleontological enthusiasts kicking off Dino Day. Determined that the prehistoric show would go on, rain or shine, the mayor, beneath a stars-and-stripes umbrella, splashed forward to lead the march. Behind her were a gaggle of wet but obviously excited youngsters dressed in Walt Disney Co. costumes, complete with full dinosaur heads and reptilian claws at the hands and feet. Dino Day was both a fundraiser for the local dinosaur sculpture project and a celebration of the town's unique place in the world history of dinosaur discovery. 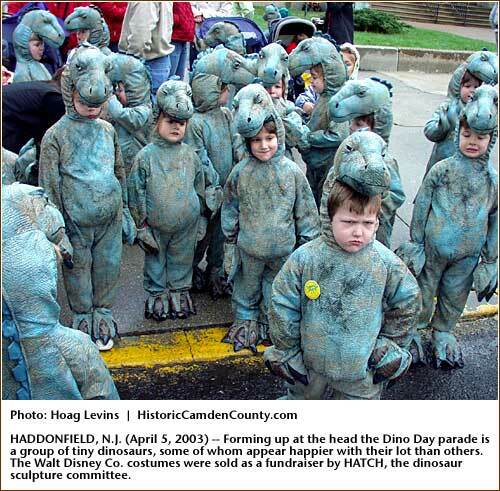 Organized by HATCH, the Haddonfield Garden Club initiative that will install a one-ton bronze dinosaur statue in the business district in October, Dino Day activities sprawled across more than a mile of the 2.9 square-mile town. Four churches, an art center, the Masonic Hall, high school, a bank, a local artist's barn studio and a rare book shop were venues for dozens of entertaining and educational dinosaur-themed events throughout the day. Rough estimates put the day-long crowd size at about 1,200, with more than 900 people purchasing the $8.00 buttons that provided entrance to the for-fee events. HATCH organizers also collected donations at many locations and sold around $2,000 worth of Hadrosaurus mugs, hats and T-shirts. A final tally of the total Dino Day take was not completed as this article went to press. All proceeds go to fund the sculpture project whose total cost, including engineering and landscaping work in Lantern Lane, is estimated at about $100,000. 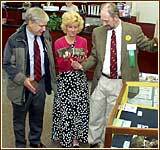 Equity Bank manager Rosanne Tizzano (center) holds a 75-million-year-old Hadrosaurus bone, assisted by Dr. William Gallagher, (left) author of When Dinosaurs Roamed New Jersey, and Academy of Natural Sciences' Ned Gilmore (right). Also see larger photo. HATCH Committee. "The original idea for Dino Day was to have a modest little fair -- something like a field day in Crow's Woods with games and a few speakers. But in the end, it became this, stretching all along Kings Highway." The single most frequent question HATCH staffers were asked during the day, according to co-chair Beverly Aldeghi was "Are you going to do Dino Day again next year?" "Although I don't think the same HATCH Committee will pull it together again," Aldeghi said, "there is obviously a very high level of interest. We're keeping really good records so we can pass them along to others who may step it to organize Dino Day as an ongoing annual event." 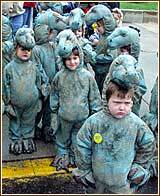 One local merchant who is in favor of an annual Dino Day is Rosanne Tizzano, manager of the Haddonfield branch of Equity Bank. Located on Kings Highway just across the street from Lantern Lane, the Bank was a Dino Day venue, turning its central atrium into a day-long display of five of the actual fossil bones of the 75-million-year-old Hadrosaurus foulkii. Ms. Tizzano has also partnered her bank with the HATCH committee for a Dinosaur Coin Bank promotion that raises money for the dinosaur sculpture project and teaches children about savings. She said the branch completely ran out of the free coin banks by lunch time. "I've been surprised at both the numbers of people who are coming in and the level of interest shown by adults and children," said Tizzano. "We've had families come in not just from surrounding towns but from Mullica Hill, Medford, Shamong and a variety of places in Pennsylvania." The most popular stop on the Dino Day 'Bone Bus' shuttle was the studio of artist John Giannotti, where visitors could see the clay model of the Hadrosaurus foulkii sculpture that is now covered with a bronze-colored coating. Also see larger photo. the Fall Festival, but today's was the biggest turnout we've ever had from any event," she said. "I'd very much like to see this happen again next year. 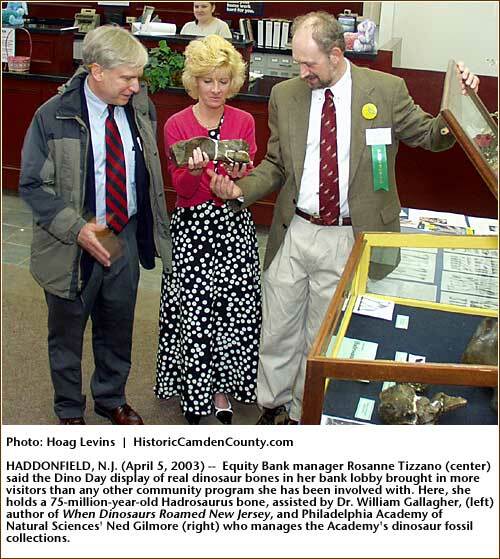 It was the first time four of the fossil specimens on display in the bank had been physically back in Haddonfield in 145 years -- since they were dug up and transported to the Philadelphia Academy of Natural Sciences, where they have remained ever since. 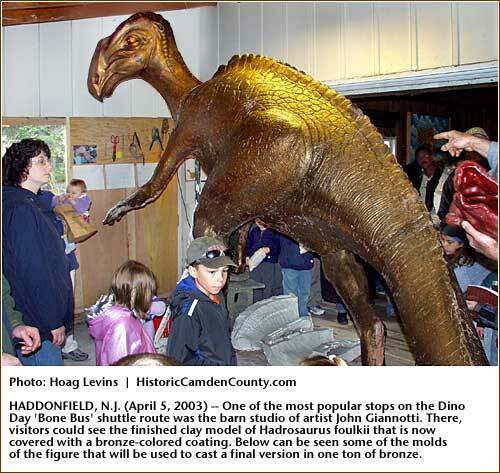 The fifth bone -- part of the Hadrosaurus' foot -- made its first trip back to Haddonfield in 1995 for the ceremony dedicating the Maple Avenue discovery site as a National Historic Landmark. Ned Gilmore, manager of the Academy's vertebrate zoology collections, was on hand at the Equity branch all day, fielding questions from crowds that often surrounded him four and five deep. "They've been coming in all day," he said, taking an afternoon breather. "And a lot of the teenagers know a lot about dinosaurs and have very good questions. Many seem to be just understanding how Hadrosaurus foulkii fits into the larger picture of dinosaur discovery." Perhaps the full meaning of Dino Day events was best expressed by Michael O'Neill, one of the speakers at Dino Day's lecture series for adults held in the cavernous sanctuary of the Grace Baptist Church on Kings Highway. A senior paleontologist at the U.S. Bureau of Land Management, O'Neill is a nationally renowned authority on the subject. The Bureau is the federal agency that oversees the preservation, excavation, scientific analysis and museum display of the dinosaur fossils found across 262 million acres of public lands. It administers public fossil resources found in more than 100 major museums. "I'm here as a paleontologist and you are all here for Dino Day because of what happened in this town 145 years ago. The discovery of the Haddonfield dinosaur fossil was the catalyst that led to everything we now know about the dinosaurs." 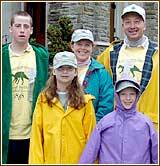 Members of the Foulke family of Pennsylvania were special guests at Dino Day. They are related to the 1858 discoverer of Haddonfield's Hadrosaurus foulkii, William Parker Foulke. Also see larger photo. Dinosaurs.' Visit any mainstream book store and you'll find shelves of dinosaur books -- I was recently in a children's book shop and counted 93 dinosaur titles. When you walk past any street corner newsstand you are likely to see dinosaurs even on the covers of magazines like Newsweek and National Geographic. Our fascination with dinosaurs has become part of who we are. And we owe thanks for all of this to William Parker Foulke's discovery of the dinosaur to which his name is forever attached: Hadrosaurus foulkii. One of the surprises of Dino Day was the appearance of Bruce and Melissa Foulke and their three children. Residents of Worcester in Montgomery County, Pa., the Foulkes are related to William Parker Foulke. 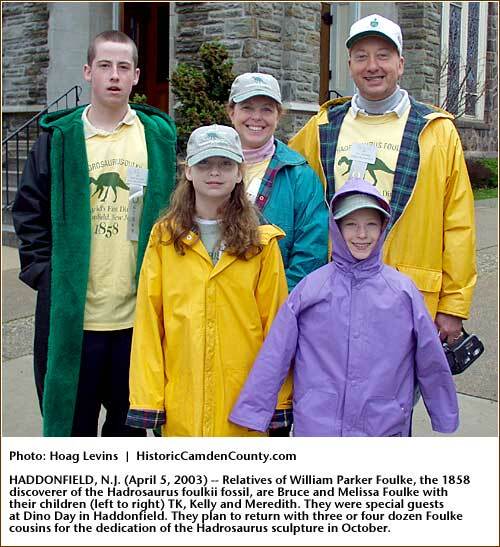 Bruce Foulke, president and CEO of the American Heritage Federal Credit Union, said it was the family's first visit to Haddonfield and that they had only recently come to understand the historic importance of the fossil unearthed by their ancestor. "We got a call from a New York Times reporter who was doing a story about the HATCH sculpture project and was trying to locate someone related to William Parker Foulke," said Mr. Foulke, who is also chairman of the Foulke family's reunion committee. "We didn't know anything about the sculpture, but the reporter told us to go to the Web site Hadrosaurus.com and that's where we learned about it and what's going on here today for Dino Day. We decided we really had to be part of this." The Foulkes visited the Maple Avenue discovery site and spent time in the barn studio of artist John Giannotti, experiencing the clay version of the Hadrosaurus figure up close and personal. "We didn't realize how monstrous it was until we actually stood there and looked up at the sculpture," said Foulke. Before heading back to Pennsylvania, he donated $1,000 to HATCH in the name of the Foulke family committee. He also said he was looking forward to organizing three or four dozen cousins to attend the October sculpture dedication ceremony as an official Foulke contingent.